You do NOT have permission to use this commercially, or in any way that earns money! I went back and tweaked the colors. Now the color schemes on either side are more in line with their individual stained glasses. I personally like this one better because I believe I made the bottom half too dark the first time. Design is inspired by the Stations of Awakening from the Kingdom Hearts series, copyright Square Enix. Would you be ok if I use this for a crossover project I'm doing? As long as it's not for profit and you credit me. 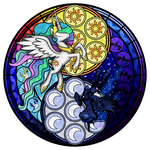 I wish to turn a stained glass image of Celestia & Luna and another of celestia into a one off turntable slip-mat, no alterations no obscuring or blurring of your embedded logo, full credit and so on... Would that be ok? I can put a pic up if you like. That would be pretty cool. Yes pics please, and please credit/link when you post it/them. Love this piece of the Royal Sisters!! you know? there is a t-shirt design contest in we love fine, u should upload some of this! there are bi-weekly winners I think, u could win! I've submitted one already, but it hasn't won. What do you mean by repeats? The pattern looks pretty varied to me. When I compare the two, the old one feels like it is the stain glass as seen at night, sort of anyway, and this one is like it is seen during day light. I was having a hard time pinning down why i thought they were different, but your comment clicked it in my head.